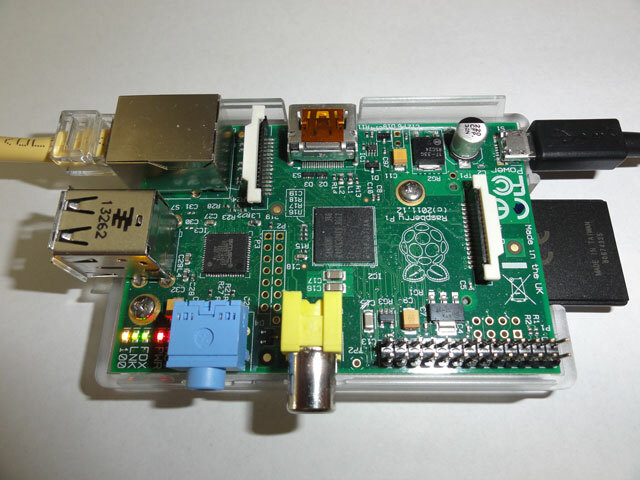 Using Raspberry Pi as a simple linux server is really easy. As an example we could setup a DNS and a DHCP server for our local network using the dnsmasq service. Having a local caching DNS server speeds up the name resolution. In addition the DHCP service can be easily configured to give a name to each device in the LAN so that you can connect to the devices using a name of your choice instead of an IP address (or some default device name). I’m going to use Arch Linux because it provides all the needed tools without anything extra (like graphical user interaces). Using only the command line interface is quite enough for a simple server system. The installation steps are described below. 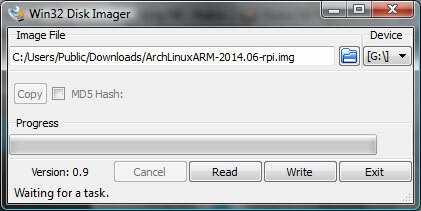 Get the Arch Linux SD-card image file from the Raspberry Pi website. Insert the SD card to Raspberry Pi, connect the ethernet cable and the power supply cable. No display, keyboard or mouse are needed because we can login with SSH remotely. You can select either the complete tool set or just the command like nmap tool. Nmap will scan the local network and display the IP address for every device that it finds. Next fire up PuTTY, enter the Raspberry Pi IP address and login. Username is root and the password is root. If you are like me and using a non-US keyboard you may want to change the keyboard layout and update the keymap setting in the file /etc/vconsole.conf. To setup the locale edit the file /etc/locale.gen and uncomment the line that matches your locale. Then run locale-gen. The time zone is set by creating a symbolic link from /etc/localtime to a time zone file located in /usr/share/zoneinfo. In my case it is Europe/Helsinki. By default Arch linux is configured to use dynamic IP address (via DHCP). The network profile is defined in the file /etc/netctl/eth0. The ExecUpPost line will invoke ntpd to synchronize the time when the network comes up (the time servers are defined in /etc/ntp.conf). This is necessary because RPi does not have a real time clock and thus will forget the time when rebooted. interface and stop the profile when the cable is unplugged. The ifplugd is a kind of supervisor for the network interface. It detects when the network becomes available (e.g. when the ethernet connector is plugged in) and configures the network interface using one of the available profiles in /etc/netctl. It is actually quite useful in a headless setup where losing the network would mean that you have to connect a keyboard and a monitor to get the system up again. As an experiment let’s turn off the network and see what happens. rpi avahi-daemon: Interface eth0.IPv4 no longer relevant for mDNS. rpi avahi-daemon: Leaving mDNS multicast group on interface eth0.IPv4 with address 192.168.1.167.
rpi avahi-daemon: Withdrawing address record for 192.168.1.167 on eth0. rpi ifplugd: Link beat lost. rpi ifplugd: Link beat detected. rpi avahi-daemon: Joining mDNS multicast group on interface eth0.IPv4 with address 192.168.1.167.
rpi avahi-daemon: New relevant interface eth0.IPv4 for mDNS. rpi avahi-daemon: Registering new address record for 192.168.1.167 on eth0.IPv4. But what if I would like to switch from the dynamic IP address to a static one? Well first of all I will need a suitable network profile. There are a few example profiles in /etc/netctl/examples. I will use the file ethernet-static as a template for my static IP configuration can copy it to /etc/netctl/eth0static and then edit it. AutoWired=yes This option makes ifplugd to consider also other than DHCP profiles when selecting the network profile. ExcludeAuto=no prevents ifplugd from excluding this profile during the profile selection. By default static IP profiles will be excluded from the selection process. Priority=2 sets the eth0static profile priority higher than the eth0 profile (having a default priority of 1). Hence the profile selection process will prefer eth0static. As a final step let’s reboot and check that the static IP address is taken into use. Looks like I can login with ssh using the new static address 192.168.1.6. Great! rpi ifplugd: ifplugd 0.28 initializing. rpi ifplugd: Initialization complete, link beat not detected. rpi ifplugd: Executing ‘/etc/ifplugd/netctl.action eth0 up’. rpi ifplugd: Program executed successfully. The upgrade contained a set of new configuration files. If the existing old configuration file couldn’t be replaced (e.g. because it had been edited) the upgrade process created a new configuration file with the name <config file>.pacnew. You can use the find command to find the files. I guess there is no easy way to take the new files into use. You just have to compare the files one by one and migrate from the old configuration file to the new one manually. Special care should be taken when upgrading the boot files (cmdline.txt and config.txt) because a mistake there could make the RPi unbootable. On the other hand there could be issues if a new kernel is taken into use without updating the kernel parameters coming from the cmdline.txt. Ok, I think we just need to bite the bullet and update the boot files. Let’s first compare cmdline.txt. I will split the options and sort the lines to make the comparison easier. Ok, pacnew has incorrect root device. Using the file as it is would definitely not work. Otherwise the only addition is the ‘rw’ option. Let’s add that to the current cmdline.txt file. Looking at the config.txt file it seems there are just some changed comment lines. So I think it’s safe to replace the old config.txt with the new one. Rebooting RPi confirms my assumptions. RPi still boots with the static IP address just fine. By default there is no swap space available. I will create a small swap file just in case it’s needed later on. To make it available during reboot let’s also update /etc/fstab. New apps can be installed easily with pacman. 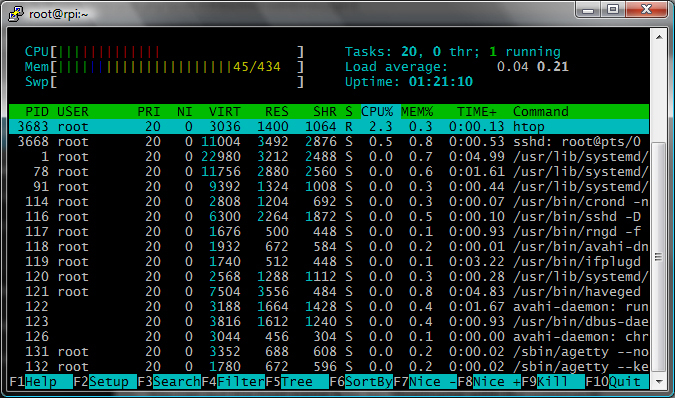 Let’s first search for my favourite process monitor. Ok, it’s available in the repositories, let’s install it. pacman -Qs <string> : search already installed packages for <string>. pacman -Qi <package>: display information about a package. pacman -Ql <package>: list the installed files for a package.